Looking to keep your customers? Engage with them! Customer engagement is the emotional connection between your company and your customers: sentiments which strongly influence their buying decisions. Customers who actively engage with a business tend to be more loyal and spend more. The infographic highlights how to approach creating a customer-centric engagement model, including being omnichannel-driven, connecting customer touch points, empowering employees with data, and transforming outdated contact centers. Over half of customers are frustrated by being unable to connect with businesses on everyday channels. Over ⅔ of marketers feel it’s critical to create a connected customer journey across all departments and touch-points. In just two years there has been 300% growth in the number of companies using analytics to better understand their customers. 40% of contact centers worry that their current systems won't deliver against future needs. 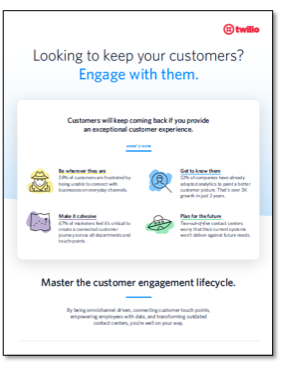 Download our infographic to see how companies who focus on the entire customer engagement lifecycle—from marketing to sales to delivery to support—have seen 277% return-on-investment in just 3 years.